As of today I started to implement some new database features for easier manipulation. COMPET-N database is converted and should work without problem but please if you notice any error while browsing, commenting, downloading, etc. demos report it here by replying. Other databases are not converted yet and any progress about them will be posted in this topic. If you intend to upload demo today or in next few days I suggest you to wait until this is completely resolved. Sorry for any inconvenience cause by this upgrade! 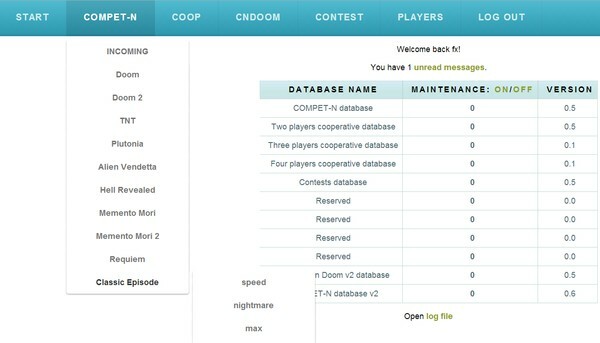 Ok, Coop, Cndoom and contest database should be working too. Still didn't test upload and database editor as I'm crowded with other work. Although the last one (editor) needs heavy fixes. ps. with this changes one more option when uploading demo is available (Type). If you are uploading normal record you can "skip" this, but if you are uploading episode or movie record please select it as it matters. After everything will be in order uploading demo will automatically update database and actual records, so there will be no need to push update except demos will not be verified by admins. If anyone is interested in helping with demo verification please let me know as my time is really limited, and I guess some of you are more active than I am and that would help a lot. So basically you would have to log in to database editor from time to time, check if there is any unverified demo, watch it, check it with lmpc tool and verify it in editor. Database editor updated. All changes to database are now logged. Uploading of Competition demos works. Still there are things to fix/finish but nothing critical, you can upload demos from now on. I'd like a few people to comment about the current time format as I am about to criticize it. I see now "00:03:08.00", so many zeroes make everything unclear. Why not just leave mm:ss for compet-n, optional hours would be displayed only for >1hour demos (really few), though 01:10:17 and 70:17 are both OK for me. Miliseconds don't count in compet-n so why bother? Yes you are right and I'll correct that. I had to change column type for nomonsters records as they are in miliseconds and you can't store 5:97, well mysql does not like it and ignores it ofcourse It will be like before for normal COMPET-N records, I'm currently working on something else. ps. should be fixed. I had once idea of removing all zeros so 00:15:47 -> 15:47, 01:24:02 -> 1:24:02, etc. Finally database editor is finished with many new options that should ease the use. Upload script is tweaked and from now uploaded records are instantly calculated and available from database. They just need to be verified by admin. Database is also tweaked to reflect new changes. Moreover, incoming will show all demos uploaded in last 60 days. This was probably answered before, but how do you upload coop demos with >=3 players?